Yoga retreat in the South of France. 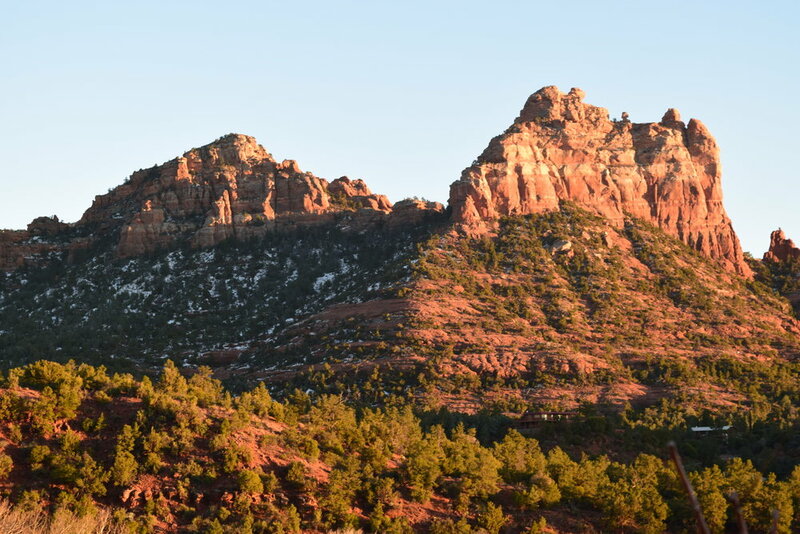 If you love yoga, want a break from your regular routine or need some time reconnecting with nature and want to spend time with some incredible people, this retreat is for you! There are a limited number of rooms, so reserve early to ensure you get your preference. Is it for a specific age group? No, all ages are welcome. This more casual trip is the perfect balance of scheduled vs. free time. Every morning there will be yoga, and in the late afternoon we’ll practice gentle yoga, stretching, and meditation. We’ll visit the marina, take a ferry ride to tiny local islands, go on casually guided walks, go to the beach, take a Groove-dance class or see a castle. There is always the option to spend time in the garden which includes a sauna and access to the sea (inlet). Everything is optional! The kitchen serves three organic meals from local produce a day – and will also treat us with snacks and afternoon tea, coffee and cake. We will have the opportunity to bond with one another during group meals, but there is ample time to also enjoy the countryside on your own. Anyone traveling alone who just wants to talk about yoga and drink tea is always welcome to hang out with me. Do I have to be a certain level of yoga? No. Most yoga classes will be taught in the Vinyasa Flow tradition with a heavy focus on alignment. Sequences will be designed to heat, stretch and detoxify. I’ll customize instructions for every level, offering modifications and providing personal attention to each of you. Beginners are absolutely welcome. Morning yoga classes will be a bit more vigorous and evening yoga classes will be gentler. What does “Shared Double Room” mean? It means you will have 1 roommate – if you’re coming alone, we will do our very best to match you with a roommate of your gender. You will have your your own bed. There may be a situation where a roommate isn’t available, but most of the time it works out fine. If you are coming as a couple, your partner is your roommate and you will have a queen bed and your own room. Some rooms have an en suite bathroom and some rooms share a bathroom. Be sure to specify which you prefer. I will help you modify your practice as necessary and give you hands-on help and adjustments. Fly into Copenhagen Airport (CHP). The cost of airfare will fluctuate, so keep an eye on prices to get the best deals. Villa Fjordhøj is about 60 miles from the airport and is easily reached by train and bus directly from Copenhagen Airport. Check-in begins at 3pm on July 5th. Send me your flight itinerary after you book. Check-out is on July 11th by 12:00 pm but you must check out of your room after breakfast. Can I bring my husband, boyfriend or friend who doesn’t do yoga? Yes. The price is the same, but all activities (including yoga) are optional. Remind me again what’s NOT included in the price? International airfare, transfer to and from airport (I will provide instructions for options from shuttle to cab), alcohol (table wine will be free at some group dinners), spa services if you plan to book any and there is a small fee (3 EUR) if you want extra towels or a “dressing gown” is 7 EUR. There may be transportation costs if you would like to join an evening or daytime boat excursion. We’re also planning an outing to the ceramic arts and craft festival in the harbor as well as optional trips to the harbor for coffee/ice cream/wine, etc. Place your non-refundable deposit here. When do I pay for the rest of the trip? Your non-refundable 500 EUR deposit holds your spot. Your balance is due June 1st. Finally, I highly recommend trip insurance! The retreat will be held at beautiful oceanfront Villa Mandala - privately hired for the occasion. 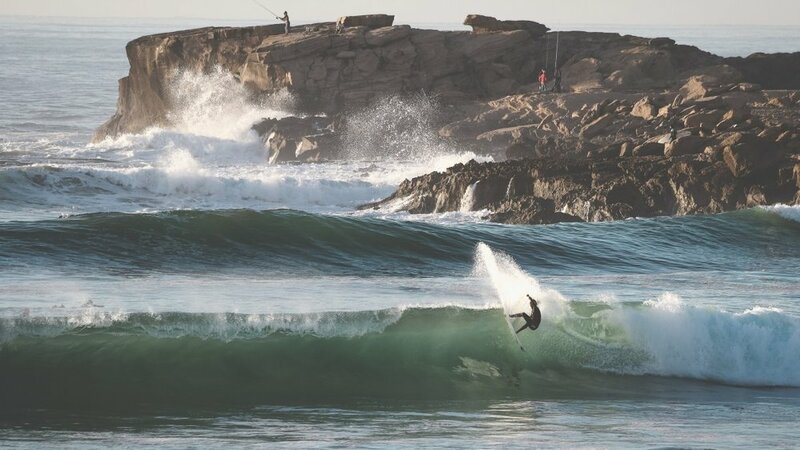 It's located on the rugged coastline, just outside of Taghazout. Villa Mandala boast a lush garden, relaxing living areas, plunge pool, and a rooftop yoga shala. We'll enjoy beautiful sunsets every evening! 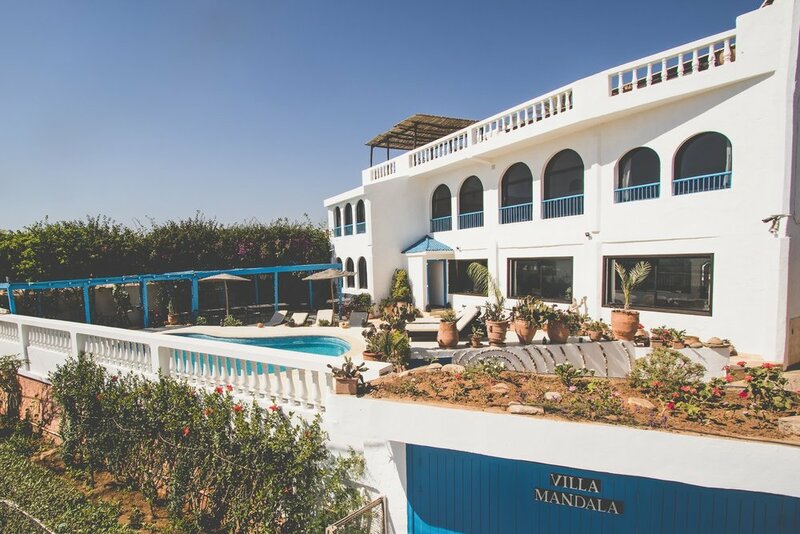 Villa Mandala offers peaceful and off the beaten path vibes, in a careing and family-like environment, dedicated to yogic practice. As such, it's been featured in The Guardian and Telegraph Travel, amongst other publications, as one of the best yoga retreat locations. vegetarian food made from local seasonal ingrediants. Menus are inspired by Ayuvedic tradition whilst including a delectable mix of Moroccan and international ingredients and recipes. a range of relaxation and rehabilitative massage therapies including Thai Yoga Massage. 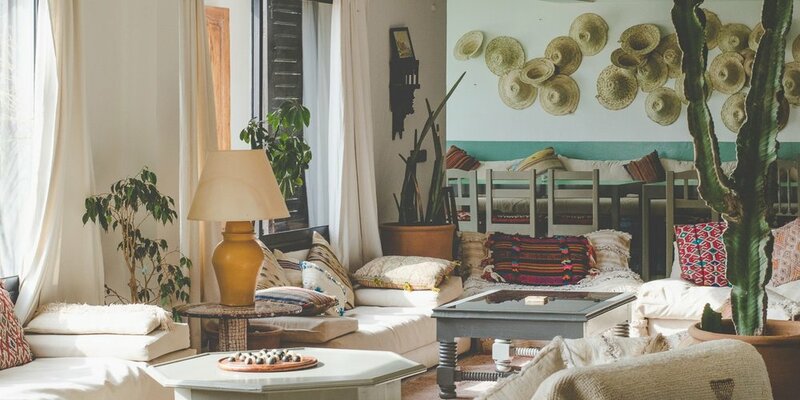 The Villa has comfortable, decorated guest rooms fusing modern design and traditional Moroccan and Indian architecture. They can be arranged as one double or two twin beds. 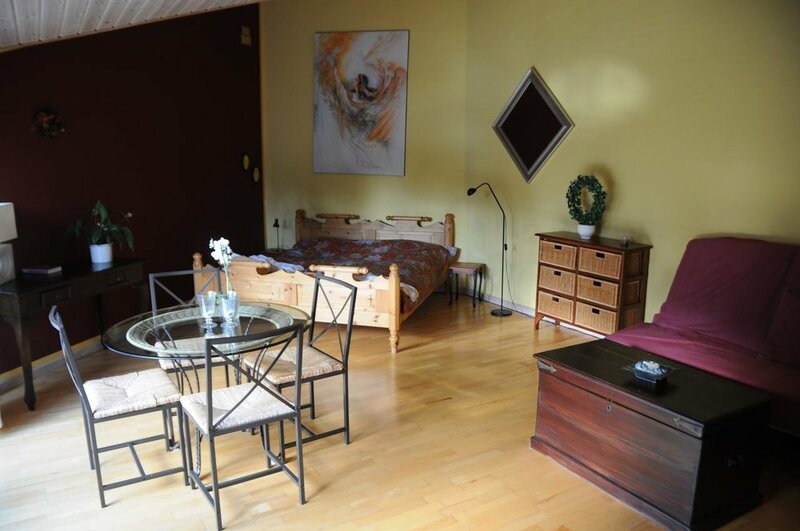 One ensuite room can be arranged as a triple or family room. 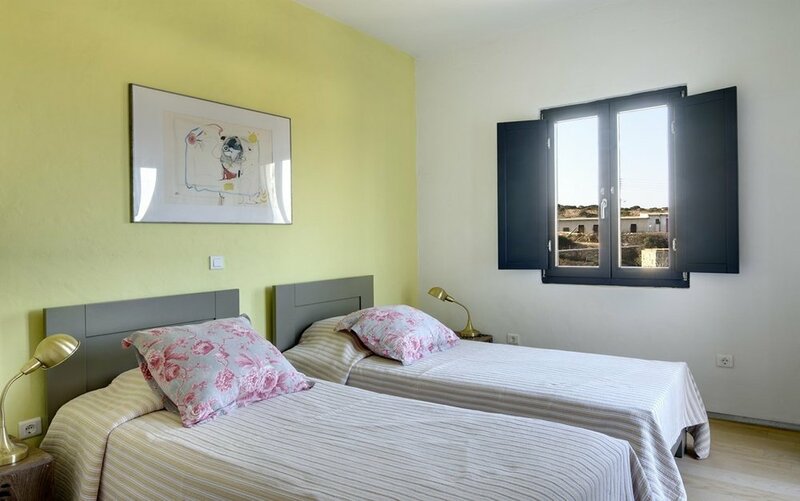 Valuing an intimate atmosphere, the Villa offers 9 guest rooms - so be sure to book in advance! 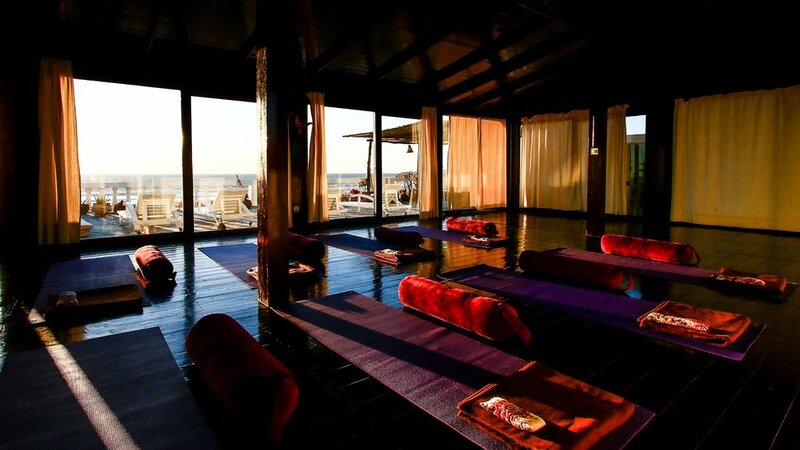 The Yoga Shala, high on the rooftop of the villa, is surrounded by fantastic views of the beach, ocean and mountains. 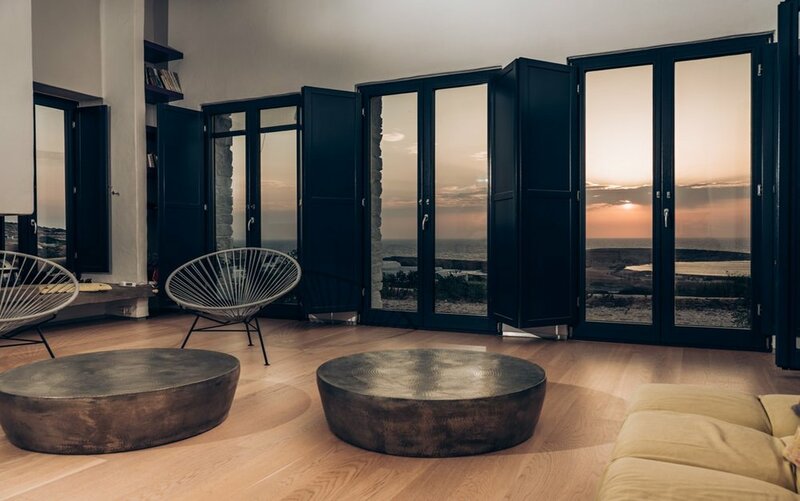 The shala's wooden finish throughout and surrounding glass dorrs allow it to be enjoyed both as an impressive indoor studio or an open airy space for unforgettable yoga practices. 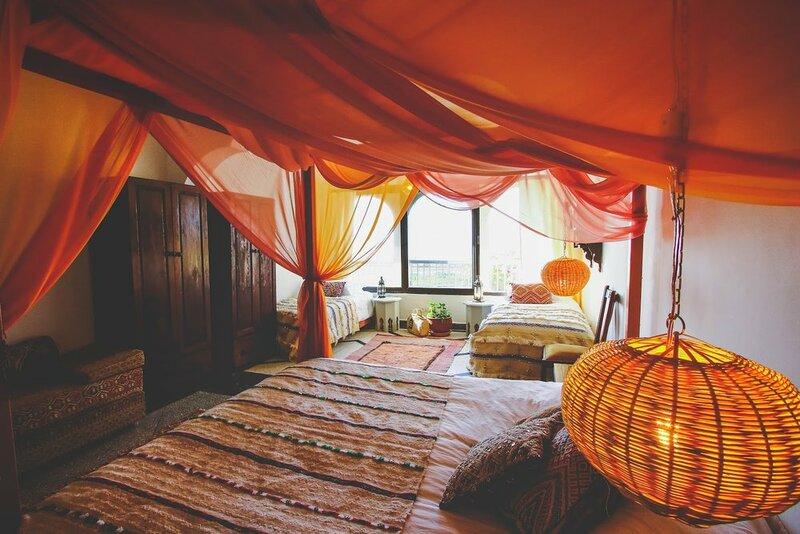 The shala is fully equipped with yoga mats, straps, bolsters, blankets, sand bags and lavender eye pillows. Suncream - it can be bought on site but it's expensive so it's better to stock up at home. Bath towels are provided but beach towels are not, so be sure to bring one. Warm clothes for the evening - due to the arid landscape, evenings can get chilly. Surfboards and wetsuits if you plan to surf: The shops sell spare hardware, wax, fins, leashes, etc but surfboards and wetsuits are not as well stocked. 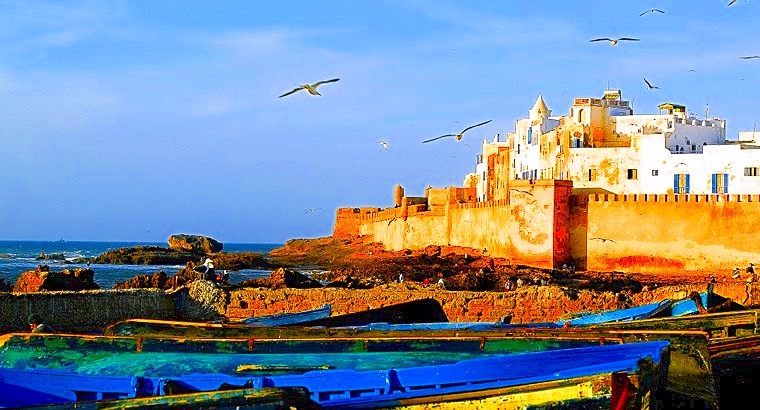 Also, don't forget: In order to enter Morocco, your passport must be valid for 6 months from the day you arrive. Please make sure that your passport is valid for 6 months after your arrival. Daily vegetarian breakfast, lunch, dinner plus tea and mineral water (fish/meat available upon request - wine is not offered but can be purchased in Agadir). Access to all amenities: Lounge area, yoga shala, plunge pool, beach. Pickups from Marrakech airport are not included in the package but can be arranged by Surf Maroc (average cost is approximately 88 EUR for 4 people. Payments for the transfer are made directly to your driver. 2 to 3 hours drive). 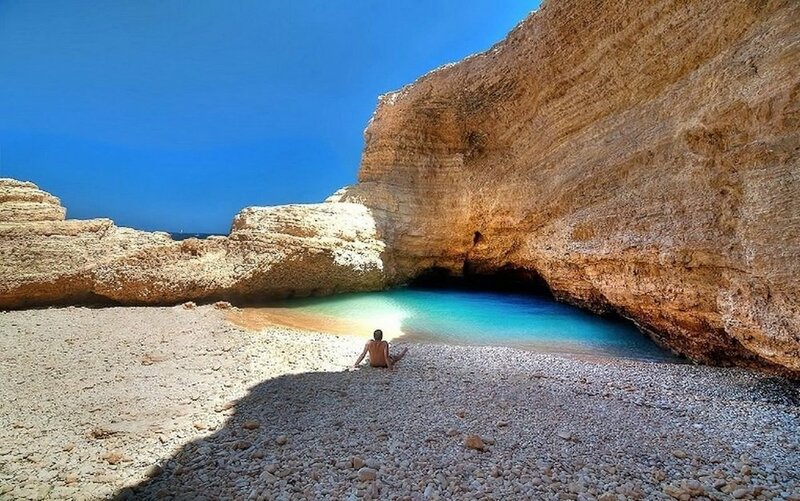 Our retreat will be held at the beautiful oceanfront Koufonisi Villas - Koufonisia means “the hollow islands” in Greek – two low little islands of a friable rock have had their coastlines nibbled away by the wind and waves to form wonderful beaches and caves and strange rock formations. Not easy to get to, not much to do – this is the Cyclades as they were 50 years ago. You’ll love it! 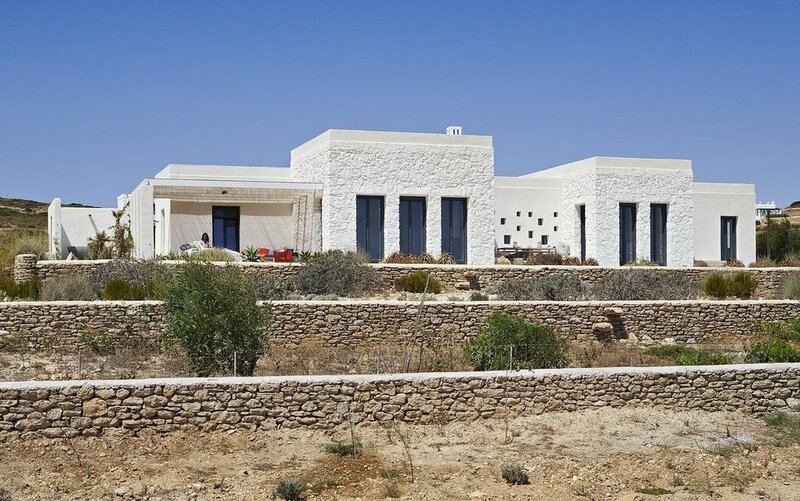 Koufonisi Villas boasts beautiful sand, relaxing living areas, and an open air yoga shala. Beautiful sunsets are guaranteed every night. 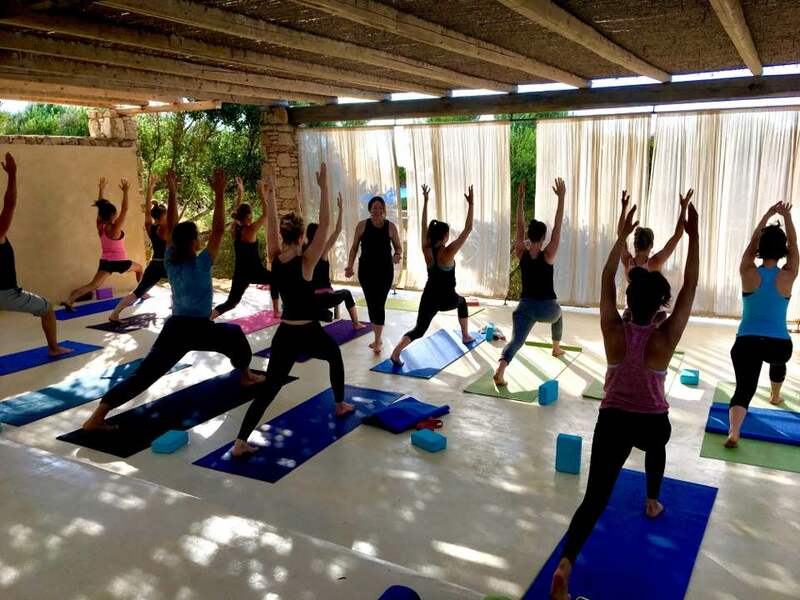 Koufonisi Villas offers peaceful and off the beaten path vibes, in a caring and family-like environment, dedicated to yogic practice. 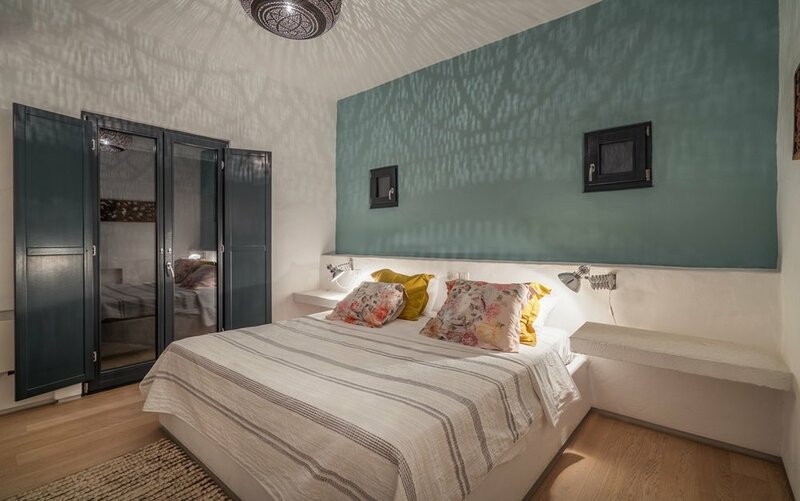 The Villas have comfortable, decorated guestrooms fusing modern design and traditional Greek Style. The owner (whom you’ll meet, practice with and love!) is the architect behind this incredibly beautiful property! The yoga shala, overlooks gorgeous white sand and crystal clear aqua water. Enjoy sea-breezes as you move through your unforgettable yoga practice. 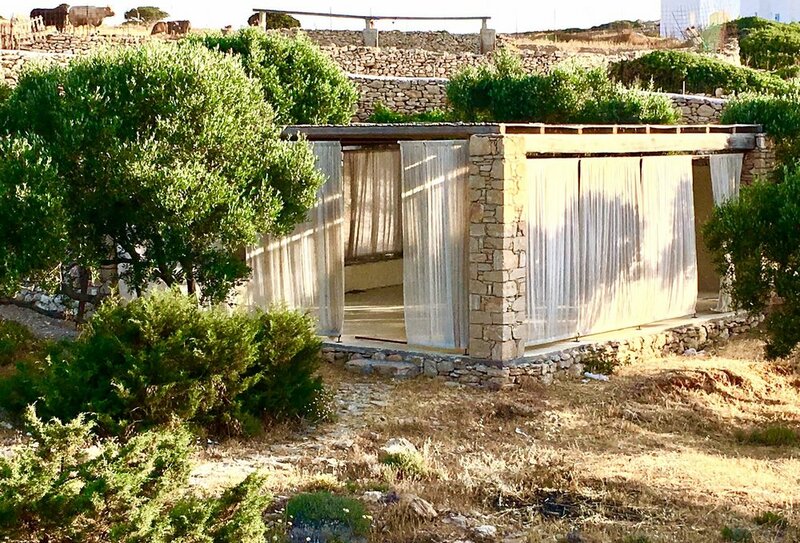 The shala’s wooden floors and concrete walls are a perfect balance to the open-air sheer curtains. The shala is fully equipped with yoga mats, blocks, and straps. While you're here, be sure to book a Thai Yoga Massage. You won’t be disappointed!! 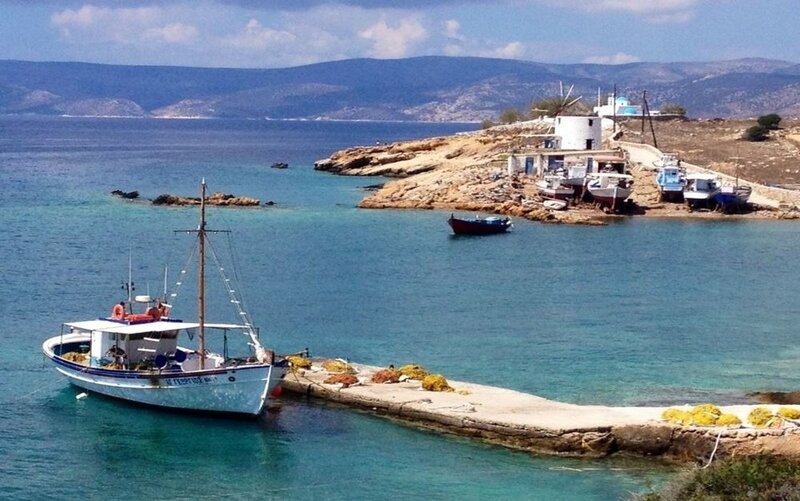 Direct International flights to Mykonos and Santorini, then a 1 and half-2 hours trip to Koufonissi by Seajet ferry. Sunscreen- it can be bought here but is expensive so stock up at home. Plug adaptors (European style ). Bath towels are provided but not beach towels - be sure to bring one! In order to enter Greece your passport must be valid for 6 months from the day you arrive. Please make sure your passport is valid for 6 months after the date of your arrival. Daily vegan breakfast, lunch, dinner + tea and mineral water (wine is not offered but can be purchased in town). Access to all amenities: lounge area, yoga shala, beach. * Trip Insurance is highly recommended! If you wish to arrive a few days before, please contact me at fightmasteryogaretreats@gmail.com and I will help you find an accommodation if the villas are sold out. Sperlonga offers some of the most beautiful beaches in Italy, and also one of the most beautiful villages ofBelpaese. History, art, culture and traditions of a small Italian town, ideal for those curious turists. Amodern 4 stars hotel, made to guaranteethe best for your holidays offering areas dedicated for relaxation, spa treatments and good traditional food. This retreat is an opportunity for all practitioners, whether beginners or experts, to deepen their study of yoga and bring the practice to a new level. In fact, this amazing opportunity is to understand ourselves and the magnificent world of Yoga. 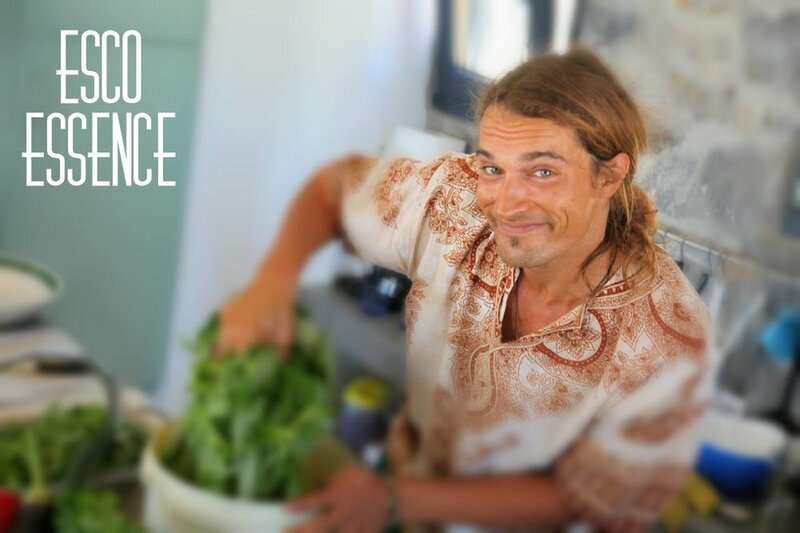 Breakfasts, lunches and dinners will be prepared especially for the participants by a chef, who will cook with organic, seasonal and local products. The Canzatora is a sandy beach frequented generally by families with children. Not very big, so it is not recommended for lovers of peace, especially during the high season. Fountain is also one of the most populated of Sperlonga, it is close to the city center. And 'in general it frequented by locals. La Grotta di Tiberio, is a natural cavity. The stretch of beach is small, but it is extremely fascinating. Salette is one of the main beaches of Sperlonga. 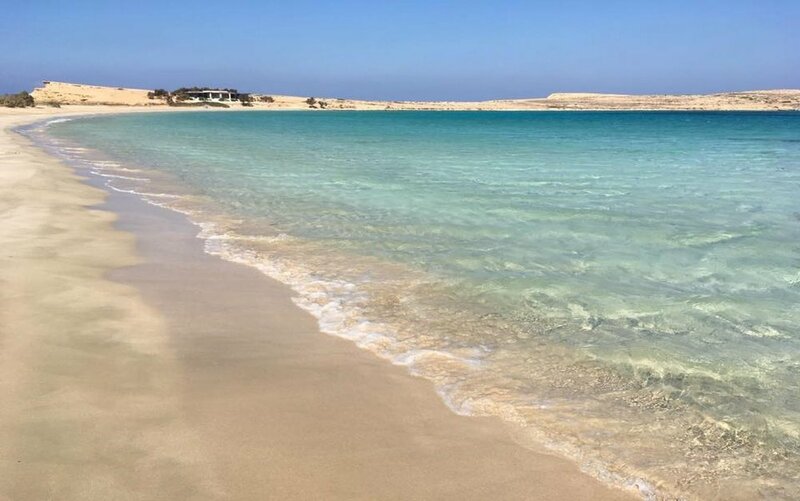 And 'composed, like all beaches in the area, from fine white sand and clear waters and is very wide. The city is made of small streets to discover the local culture. The local archaeological museum, built right near the Cave and Villa of Tiberius is hosting big groups of statues. The Truglia Tower gives an perched and tortuous aspect. 20:30 Welcome group dinner – we’re in Italy – HOORAY! (1) Daily snacks (euro 5 – euro 30). I’ll be suggesting mainly inexpensive cafe options (panini, salads, pizza).The Ventisei9 Bar has a spectacular view over the sea,olso the best italian icecream is Fiorelli. Take away pizza at Pizza Mania. (2) Transport to and from Rome airport (e-mail me for the shuttle taxi service, we can host maximum of 8 people in the mini bus). (3) Some churchs, museum or activities entry fees (euro 5 – euro 30). The price does not include transportation to and from the airport to the hotel. Before the course will contact each other participants who come from the same area, so that it is easier to get organized with transport and passages. If you like Lesley’s style, relax and do yoga. Practice,practice,practice…This is hand made for you! No, all ages are welcome. This more casual trip is the perfect balance of scheduled vs. free time. 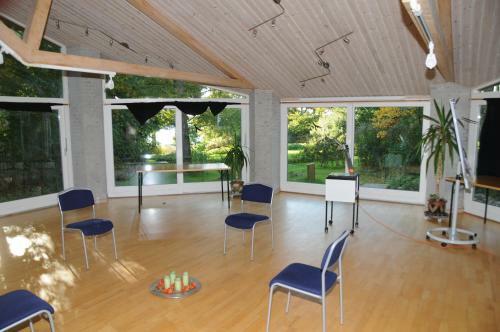 Everyday there will be yoga, meditation, casually guided walks, and church, museum or city visits. Everything is optional! We will have the opportunity in yoga and the lunches and dinners to bond with one another, but there is ample time to also enjoy some time on your own. Married couples can also do romantic things too. Younger, single folks can explore Sperlonga nightlife. Anyone traveling alone who just wants to talk about yoga and drink tea is always welcome to hang out with me. No. Every yoga class will be taught in the alignment. I’ll provide personal attention to each traveler. Beginners are always welcome. We’ll be meditating too. What does “shared room double accommodation” mean? It means you will have 1 roommate –if you’re coming alone, you will be matched with a roommate of your age and gender. You will have your own hotel room, each with your own bed. If you are coming as a married couple, your spouse/girlfriend/boyfriend is your roommate or kids and you will have a queen bed and your own hotel room or an added 3 bed. I will help you adjust your practice as necessary and be able to give you hands-on help and adjustments. Please note that this tour is very active in terms of walking. If you cannot walk or struggle to walk distances of a mile or more, this trip may not be a good fit for you. Fly into Rome Fiumicino Airport One-stop round-trip airfare. Yes. The price is the same, but all activities (including yoga) are optional. As long as YOU are committed to coming to yoga, we’re good. International airfare, transfer to and from airport (I will provide detailed instructions on all options from shuttle to cab), some church, museum or activities entrance fees. I don’t want a roommate – can I stay in a private room? Email me at fightmasteryogaretreats@gmail.com with any questions.